Backing Superintendent of Police Yatish Chandra, who has been facing backlash from right-wing activists for allegedly insulting Mr Radhakrishnan, Mr Vijayan alleged the Sangh Parivar was "attacking sincere officers to demoralise them." 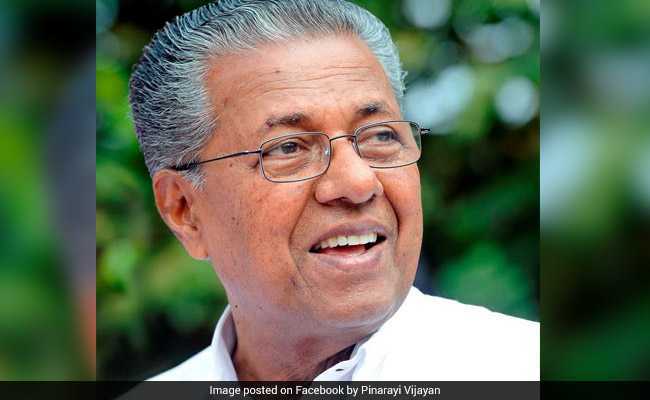 The Sabarimala shrine witnessed a steady flow of devotees Friday, even as Kerala chief minister Pinarayi Vijayan came out in support of a senior IPS officer who was allegedly embroiled in a spat with Union Minister Pon Radhakrishnan two days ago. Amid the stand-off over entry of women of menstrual age into the Lord Ayyappa temple, the State government informed the High Court that two days could be set apart for women pilgrims of all ages to offer prayers at the shrine. The suggestion was made when the court was hearing a petition moved by four young women devotees seeking protection for women of all age groups to offer prayers at the shrine besides facilities for smooth pilgrimage in the wake of the recent Supreme Court judgement. The footfalls at the Sabarimala temple, which had witnessed protests against the state government's decision to implement the top court verdict allowing entry of women of menstrual age into the shrine, picked up on Friday. The police said the temple, which was opened on November 16 for the over-two-month-long pilgrimage season, witnessed comparatively more crowd than on other days. "We are yet to collate the details," an official at Pamaba police control room told PTI. Coming out in support of SP Yatish Chandra, Mr Vijayan said the police officer was explaining the "peculiar situation of Sabarimala" to the union minister. The Bharatiya Janata Party and right-wing activists observed a dawn-to-dusk bandh in Kanyakumari in Tamil Nadu, stopping Kerala State Road Transport buses plying through the district, protesting the alleged misbehaviour of the officer. "Only VIP vehicles are allowed to Pamba from Nilackal. This is due to the peculiar situation at Sabarimala. However, the people accompanying the union minister wanted their private vehicles to be allowed till Pamba. The officer was politely explaining the situation," Mr Vijayan told reporters at Thiruvanathapuram. "The Sangh Parivar has been attacking police officials who have been doing sincere work to demoralise them," Mr Vijayan said. Real devotees would never face any issues at Sabarimala, he said, adding that the restrictions were only for the safety and security of the pilgrims. "A real devotee will never face any kind of trouble at Sabarimala. However, it's the responsibility of the police to detain those who come to the shrine to create trouble. If someone tries to hamper the peace there, police will have to intervene," he said. He rejected media reports that the Kerala High Court had slammed the government and police for its "high-handedness." Meanwhile, BJP general secretary K Surendran, whose remand has been extended for 14 more days, alleged that the office of the Chief Minister has been "unleashing" an "orchestrated" campaign to keep him behind bars. He was taken into custody earlier this week from Nilackal, the base camp of Sabarimala, after he refused to go back despite the police request. Sixty-nine protesters were arrested after they had held a "nama japam" (chanting Lord Ayyappa mantras) inside the temple complex late on Sunday, defying prohibitory orders. The Pathanamthitta district administration has extended prohibitory orders clamped in Sabarimala and surrounding areas till November 26. Though over 50 days have gone by since the Supreme Court delivered its historic verdict, no woman or girl in the traditionally barred age group of 10-50 has been able to set foot in the hallowed precincts of the shrine.